If you have little girls then you have probably encountered nasty tangles that result in tears when trying to brush them. But if you have little girls that are of school age then you might have also encountered some run-ins with not so healthy hair. Healthy hair is clean, untangled AND annoyance free! When it comes to hair products for my girls I have tried them all. Special brushes, expensive shampoos, and lots and lots of sprays. Some of them seemed okay but none of them seemed to do the trick when it came to untangling hair AND keeping the hair healthy until I started making my own. 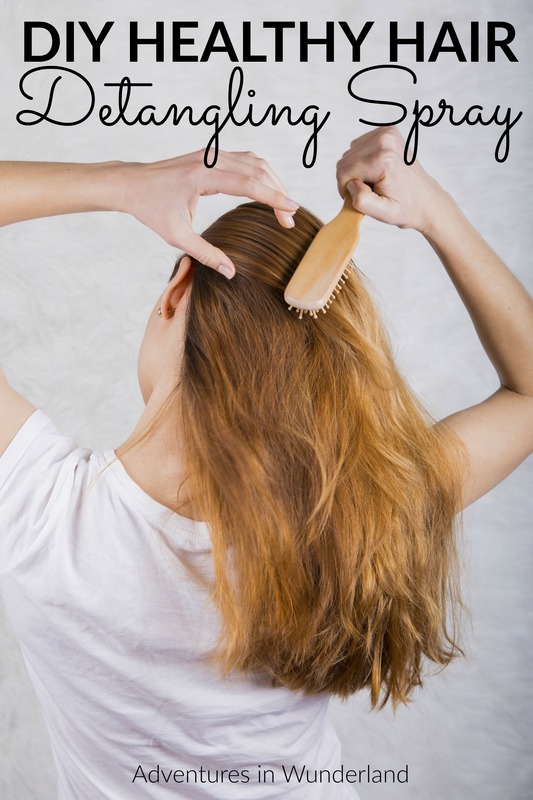 Making my own detangler is an affordable way to keep the tears to a minimum when brushing and keeps the hair healthy – even when the dreaded letter comes home from school that a classmates hair is not so healthy! Oh you know the one. The one that makes your skin crawl and your head itch just thinking about it. When the letters come home I know that I have got it covered, and my girls’ hair has a much better chance at staying healthy because we use this DIY healthy hair detangling spray every morning before they go off to school! It’s super easy to make and very very effective. Add your conditioner to the spray bottle and fill with water. Drop in your essential oils and shake well until all is completely mixed. Spray liberally daily before brushing hair. Style as usual. My girls love this detangling spray! They will not brush their hair without it because without it, it just hurts too bad. The smell is lovely and I am happy knowing I’m sending them to school with healthy hair. I have become to love my essential oils so much that I use them in my home every, single, day! They have been absolutely life changing for my home and my family. If you are wanting to learn more about my passion for keeping my home and family healthy and chemical free please check out more!